The firework display held here in New York City each Independence Day is one of the most spectacular and well-known events across the country. If you are planning to celebrate the evening with family, friends or co-workers, Metro Yacht Charters is here to make your Fourth of July evening a memorable one. 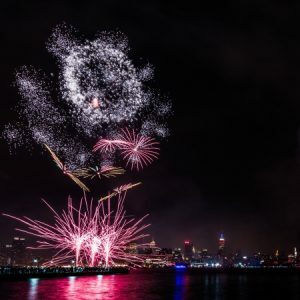 Each year for the Fourth of July the finest in the fleet of private New York Yachts charters offers four hour packages that provide our guests with the opportunity to enjoy the amazing fireworks display from the New York Harbor. All charter packages include a buffet dinner, full bar service and a complimentary house champagne toast during the fireworks. These evening charters book fast, so please give us a call at 646-780-9693 if you would like to reserve a private yacht charter for the Fourth of July. With yachts able to fit groups fewer than 25 and up to 1000, we are able to accommodate small family gatherings, large corporate celebrations and everything in between. Cheers to an incredible New York City summer! We look forward to seeing you in the harbor this season.